The evidence at hand looks very compelling that the credit cycle has turned in the world, kicked off by the downfall of the oil and natural gas industry. Energy was the spark, but loan impairment is rising around the world and before the cycle is over I’m confident we’ll see at least one major financial institution go belly up. Which in turn would then test the system’s ability to contain SIFI counterparty risks. Fear of 2008 is back and back with a vengeance, especially fear of the banking industry’s quality of assets on balance sheets across the world. Look at all the articles that have sprung up over the last week. Look at the rise of credit default swaps on financial institutions, specifically European entities. Investors are acting as if the ECB doesn’t exist and that European leaders somehow won’t acquiesce to the notion of an increase in monetizing commercial bank assets to calm things down. Deustche Bank’s balance sheet has the whole world in a tizzy but the jawboning has already begun by Schäuble and I have no doubts that Draghi will increase Euro-area QE to settle things should fears continue rocketing higher. I know that the public as well as the powers in charge do not have the stomach for another bail-out like we saw in 2008. Bail-ins will occur when a true crash occurs but before then we’ll continue to see back-door bail-outs that are easily sold to the investing public. The fears are not just consigned to European banks. As further proof of an excessive level of 2008-style fear, Forbes featured an article by Peter Tchir sharing the above index of credit default swaps pricing for senior financial institutions. 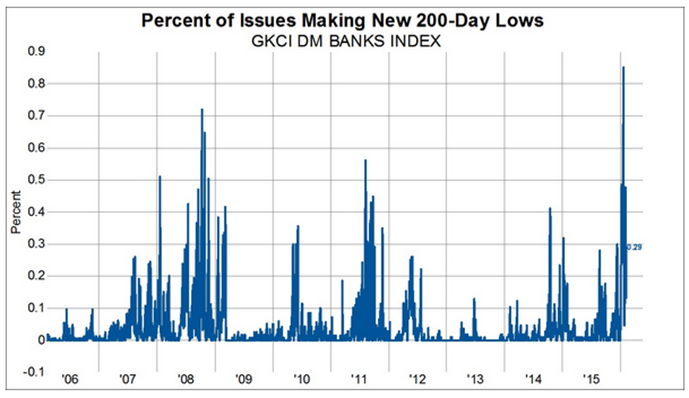 And just look at the performance of bank stocks as depicted by GaveKal. Relative to the lows of the 2008 and 2011, bank equities are performing at their worse over the last 10 years. This is incredible to me. In 2008, it was as if people thought the whole system was going to implode. Literally. As for 2011, the fears centered on the Mediterranean as people thought Greece and Italy were going to sink into the seas dragging down the world economies with them. 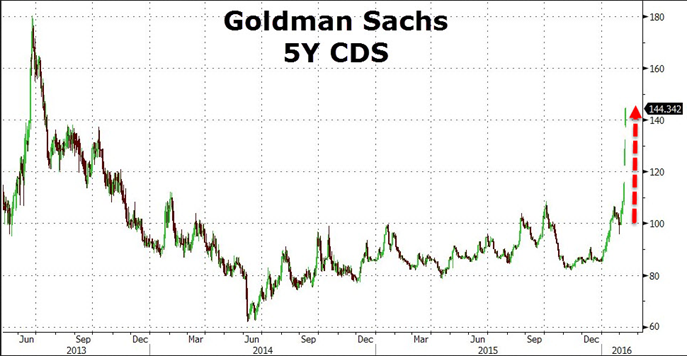 Even the all-seeing eye of Goldman Sachs is being assailed upon. 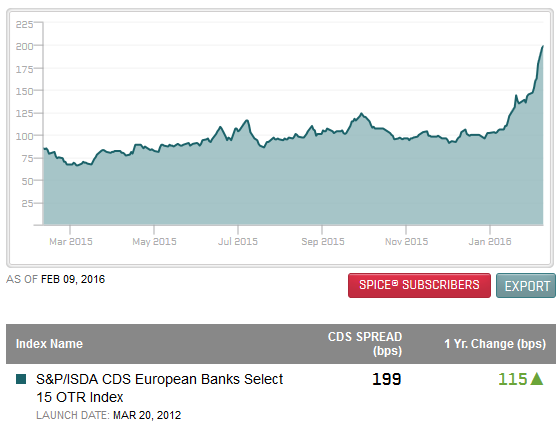 Just look at the gap-ups in the pricing of the squid’s 5-YR CDS, courtesy of ZH via a Bloomberg. The fears surrounding the world’s financial institutions are not unfounded. There are countless current articles on the deterioration in credit quality in addition to the impairments of balance sheets at financial institutions around the world. It’s just the intensity with which markets have become scared of virtually all banks is truly remarkable. The ability and the will to continue and increase quantitative easing in Europe and Japan is not being properly discounted. The US does not have to go so far as initiating QE again. Yellen and crew can simply jawbone fears downward by stating they will desist from further rate rises, which we’ve already seen Yellen hint at today. If needed the Fed can simply reverse the rate increase it implemented months ago and that should put a wind in the markets as speculators collectively wipe the sweat from their brows, despite the actual message that would be conveyed. If we were currently in the midst of a market crash where indices drop by 50% or 60% then it would be the first one I’ve ever read about where people saw it coming months in advance and common market fears totally anticipated it. As I’ve said before, that’s not how these things work. Markets don’t crash while everybody is staring straight at them. That may be attributing too high of a weighting to mass market psychology, but I stand by the contention. I suspect that animal spirits will be assuaged through various methods by the central banks of the world. Then stock markets can reassert a positive trend on to new highs. Despite the fact that debt markets are far larger and far more important, the stock markets are the thermometer of risk that people seem to spend the most attention on. If 2016 is to be the final hurrah for the stock markets before a rehash of 2008, then I think price action in the S&P 500 could resemble what we saw coming out of the lows of Q3 2011 but on a shorter timeline. There are many sentiment indicators that are showing an excess of fear. People seem to be expecting a 40 VIX or some sort of blow-off to mark when to get back into stocks to take advantage of the final run in risk-on, but I contend that the markets have shown enough of their hand already. I’ve already allocated capital into trades to take advantage of a bounce in markets. If correct, I think we could see a real face-ripper of a move. Should the Investing Public Be Worried if Some of the Biggest Banks are Genuinely Scared?